This string light generates warm white light that specially designed for indoor and outdoor lighting during special events such as Christmas. It has approximately 20 well-designed and well-spaced LED bulbs with 7 feet wire that generate a warm and relaxing light. As soon as you light up the light, the warm white light creates a romantic atmosphere for home, garden or Christmas party decorations. 1.Please be careful when you bend and wind the wire,if you over-bend it,it is easy to break. 2.The wire and LED lights are waterproof.But the battery box is not waterproof. 6 colors to choose:We have warm white,white,purple,green,blue and multi-color for you!At night,the wire is invisible,only lights shining,the soft and beautiful light makes you feel comfortable,not too strong or too weak. Light up your life:Wrap them around plants, furniture, or anything else,then just turn on the switch,it will make your space sparkle, creating a romantic and warm atmosphere for your Bed room,living room,garden and any occasion you can think of (wedding,Christmas,Thanksgiving,dinner party). Safe to use:Waterproof(except the "battery box"),low heat emission and no pollution,you can touch the light with bare hands and won't get hurt.Kids can also use it safely. 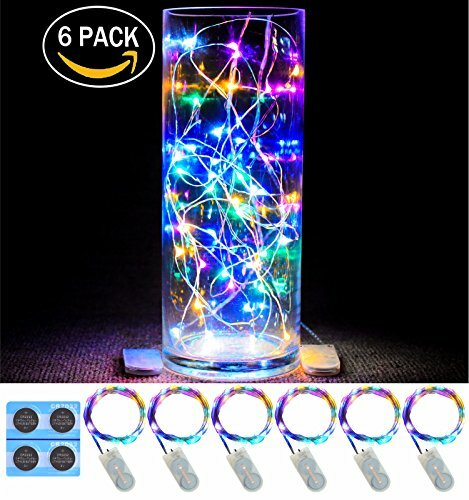 What you get: 6 pack of LED string lights(batteries included),4 pcs complimentary batteries and 45 days money back and 18-month warranty.If you have any problem with our product,contact us!We promise that we will make every effort to solve it.